Our good old "Servel" refrigerator came with the camp when we purchased it in 1972 and it has been a fine refrigerator. We planned at the time to get a year or two out of it; but with great service from fully licenced and experienced propane technicians, it kept cold for the next 33 years! However, during the summer of 2006, the old Servel behaved in a totally unsafe manner and we haven't used it since. I hope the details of this behaviour may help prevent a disaster for someone else. The large "main flame" that causes the system to cool. 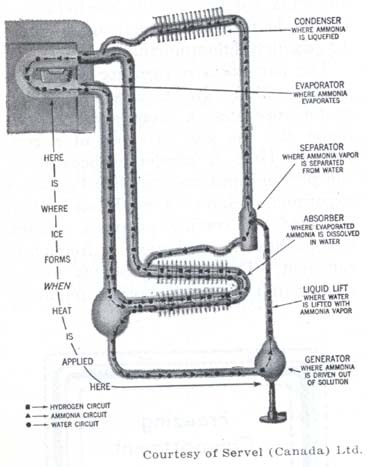 This flame is shown in the diagrams below. The small "defrost flame" that keeps the generator and bimetal strip warm when the refrigerator isn't actually cooling. This flame also keeps the generator warm while the refrigerator is on the defrost cycle. The tiny "lighter flame" used when starting the refrigerator to heat the bimetal strip so the propane will start flowing. Well, in August 2006, the old Servel was cooling fine, but the defrost flame was too low. The bimetal strip cooled and shut off the gas as it is supposed to. I managed to re-light it once, and then it went out again. I decided to let everything either cool down or warm up and try re-lighting. Thirty minutes later, the tiny lighter flame was really small and not nearly large enough to heat up the bimetal strip. I decided to wait a bit longer and try again; but I didn't turn the gas off. Fortunately, I was working right in the next room, because what happened next is not supposed to happen! After about forty-five minutes, unlit propane gas began flowing by itself even though the bimetal strip was cool! I heard the hissing sound, lit the flame, and the Servel cooled once again. However, when the refrigerator had cooled, all flames went out again. It was at this point that I turned the Servel off for good and we haven't used it since. It was not safe. The flame on our old Servel could go out and then start releasing unlit propane gas a half hour to an hour later. We could have burnt the camp down or perhaps blown it up if no one heard the gas. Someone could easily have died either from either a fire or from gas asphyxiation; but more than likely from a propane explosion when escaping gas reached the pilot lights on the stove. Update December 2009: Vintage Servel Refrigerators suggested the seal inside the "Klixon valve" may have failed. This is a very rare occurrence. 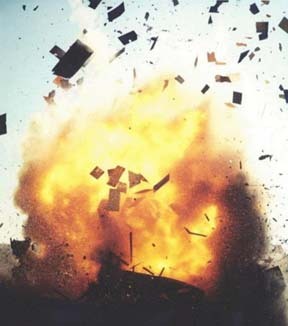 Well, O.K., maybe it wouldn't have been this bad; but our old camp would have been a decidedly unhealthy place to be if the propane fumes had built up and reached the pilot lights on the propane stove. On the other hand, gas explosions can be very destructive . . .
Now, this isn't supposed to happen. Servels are not supposed to release gas unless the bimetal strip is hot. This is supposed to make sure the gas flow stops if there is no flame. However, it most certainly did happen and I was right on hand to observe this behaviour and make notes which I still have and referred to while writing this page. I would urge anyone with an old Servel not to take any chances. Service it regularily and keep it in proper running condition; see Vintage Servel Refrigerators below for help. NOTE: We had the Servel serviced two months prior to this problem. It working perfectly in June, but finally gave up the ghost in August. If we owned an antique automobile from the 1940's, had it serviced and then headed off to Toronto, it would not be appropriate to blame the mechanic if something went wrong during the trip! The old Servel was a great refrigerator and it had expert service and maintenance. However, its life appears to be over - and fortunately, mine isn't! I hope the above story may help prevent grief for others. 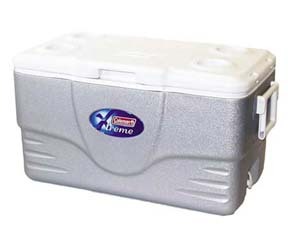 We have switched to a "Coleman Xtreme" cooler and don't intend to take a chance with propane refrigerators again. These coolers are available through Canadian Tire, Wall-Mart, Zellers and others. Strangely enough, my cousin Brian Sewell who has a camp near Williams Lake, B.C. had a similar experience during the summer of 2007 with an old Servel. Their problem related to a worn out burner and the production of unpleasant aldehyde gases. Brian and his family switched to a "Coleman Xtreme" cooler as well. New propane refrigerators are said to be "safe"; but ice is totally guaranteed not to release inflammable and potentially explosive gases! why the refrigerator gets cold when you apply heat to the generator. The gas refrigerator involves no moving parts and is, consequently, silent and automatic. The sealed tubes contain water, ammonia and hydrogen. Ammonia, which is ordinarily very soluble, is expelled from the water by the heat of the flame. 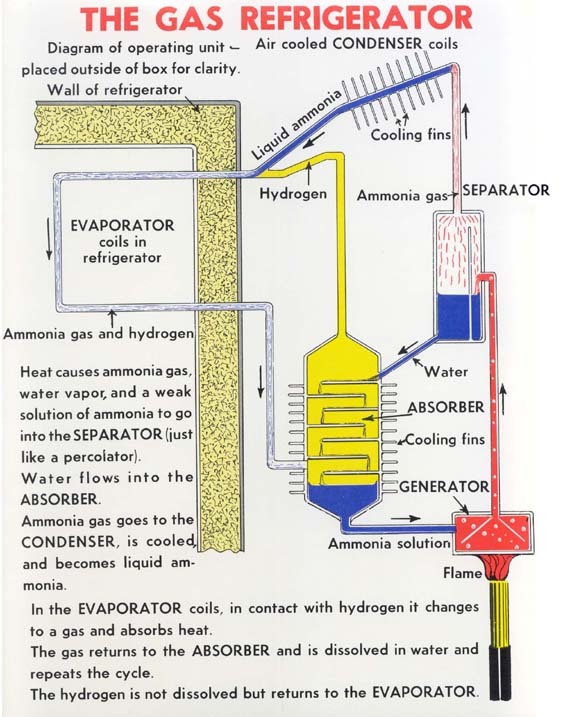 A combination of the pressure created and the simultaneous cooling by the air causes ammonia to liquefy. It now proceeds to the cooling-unit, evaporates, absorbs heat, redissolves in the water and is ready to repeat the process. Hydrogen is used to prevent the formation of a vacuum which otherwise would be caused by the rapid dissolving of the ammonia. This avoids “pounding”. The refrigerator is simple in its principle of operation but its structure is somewhat more complicated than this explanation would lead one to believe. New propane refrigerators are said to be much safer and are still being sold. Try a search engine such as Yahoo, Google or MSN Live, etc. Search for "propane fridge" or "propanefridge"
This page posted by Robert Sewell September 2008 and updated September 2017.